Many birds native to Northern Ireland could become extinct, the Royal Society for the Protection of Birds has warned. A report published by the charity says the numbers of woodland and farmland birds are at their lowest level ever. The report revealed that farmland bird numbers have plunged by as much as 60% over the past 20 years. Species at risk include the corncrake, lapwing and the peeweet as their natural habitat disappears. Dr James Robinson of the RSPB says good land management is the answer. 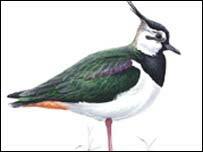 "Lapwing and redshank bred for the first time in a recently cleared nature conservation area next to the City Airport, showing that people and birds can co-exist and do so successfully," he said. "The message we need to take away from the report is not to get depressed but to do something now so that the environment is safeguarded for people and wildlife." The report also warns of a threat to seabirds due to a combination of over-fishing, climate change and diseases such as botulism from landfill sites. Dr Robinson said the decline in the bird population was a wake-up call to people. "Birds are at the top of the food chain and any fall in their numbers indicates that something is wrong with the environment," he said. "It could be anything from water quality to depleting fish stocks. "The Common Agricultural Policy from Europe has been the main mover behind the drastic falls in some of our most beloved species such as the peeweet, yellow yornie and curlew. 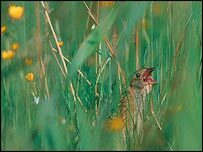 "The corncrake, once a common visitor to these shores is all but extinct in the north and struggling at record levels in the south." However, the report also shows an increase in the numbers of birds of prey including buzzards and peregrine falcons. "They have seen some recovery, however it must be remembered that they suffered the most appalling declines in the 70s when the pesticide DDT was used," said Dr Robinson. "Their numbers crashed then and they are only starting to make a recovery."